I went to see Wynton Marsalis and the Jazz at Lincoln Center Orchestra (JLCO) last night at a vintage hall here in St. Louis, The Sheldon Concert Hall (730 seats). I went for 2 reasons. First, a compelling interest in Jazz music and second, the opportunity to hear a big band in a hall correctly scaled for their acoustic sound. This hall has the local reputation of “perfect acoustics”, a word pairing that always makes me shiver. 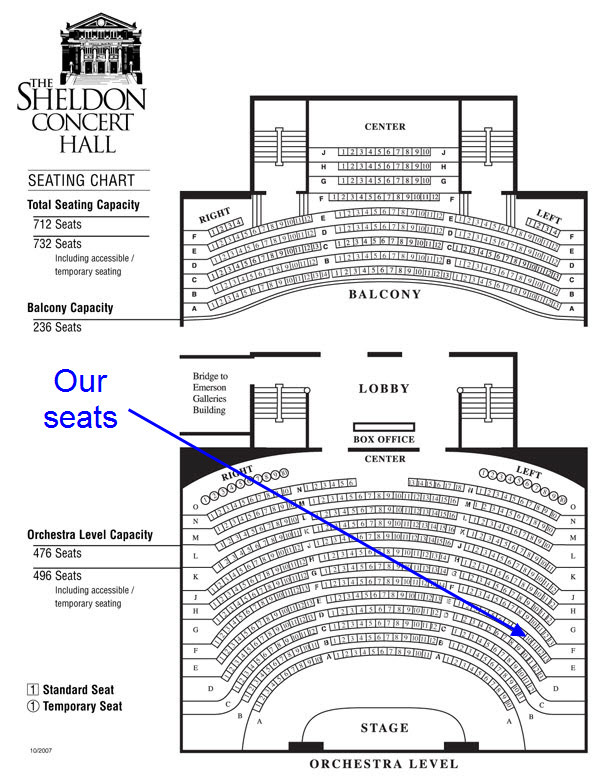 When I meet someone new here in StL and they find out I am a sound engineer, two things are guarranteed: I am told about how great their Bose speakers are and about how great the acoustics are at the Sheldon. Up to this point I have not experienced a happy result with either. In the case of the Sheldon it has only just now “upgraded” its sound system from a single Apogee AE-? that I suppose was put in when the hall was built in 1912. The new speakers are homegrown – yep – made here in Missouri – the pinnacle of pro audio manufacturing. In any case the hall has never sounded good for any shows I have seen – all amplified – and all with great POTENTIAL to sound good. In other words – not stacks of Marshall’s for the Cheap Tricks reunion – light acoustic acts like kd Lang, Norman Blake and others. But here is a chance to see a 15 piece big band with a hall full of people who are NOT the parents of the players – this is not high school – not college – it is the real deal – and there are VERY few of these endangered species around. A chance to see music hall music from the 30’s and 40’s played by a music hall band in a music hall. I hoped – but COULD NOT BE SURE – that there would be no PA. Feels kind of weird to be a sound guy rooting against using a PA but I was clear on this. I wanted the opportunity to hear it direct. I’ve heard plenty of horn sections through a big sound system, plenty of 15 piece pit orchestras on Broadway shows but this was different. These guys were going to cut loose – no worry about overloading the sound system and no worry about drowning out the singer. Let’s go. I was in line to get tickets the minute the box office opened. Turns out this was show was linked to a fundraiser’s Gala so most of the seats were pre-sold. There were only a few seats left way off the side. 5th row. 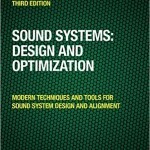 We are going to experience off axis response – yes – that is the case for NATURAL sound as well as PA. 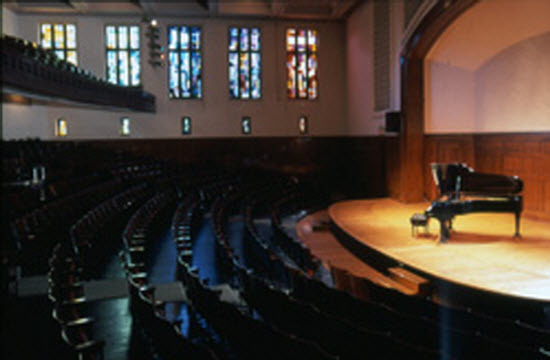 Here is a pic of the hall interior – you can see that the stage is much closer to the front row than shown in the seating chart. The black rectangle on the proscenium wall was the house PA until this year. Yeah, baby! I think you know this guy. I wonder if it is a stock toilet plunger or if they get special ones for trumpets. The show begins with seriously jazzed up arrangements of some well-known songs: Old McDonald had a Farm, The Itsy-bitsy Spider, and Kermits the Frog’s classic “It ain’t easy being green” – For real. The rest of the night’s music came from jazz’s pair of royals: Count Basie and Duke Ellington. That’s the music. But let’s talk about the sound. Directionality. We know all about that subject with our speakers. Front loaded devices go wide. Horn-loaded go narrow. Drums, bass and piano go wide. The horns – well what do you expect ? THEY’RE HORNS! One of the revealing moments was when Winton was soloing over Old McDonald. He wanted to connect with all the audience so he bobbed and weaved, up and down, side to side. The mix fell apart all through that – getting louder and softer and rolling a high-cut filter in and out. Did I say mix? Well it is a mix – even without an audio engineer in the chain of custody -and when the guy is moving a directional instrument, it is dynamically remixing every second. In addition to the modification of the direct sound, the reverb character would change as he moved – direct-to-reverberant ratio going down when he went down or to the other side and sudden appearances of the reverb tail moving around off the walls. The trumpets ruled the night. And the saxes fared the worst. The trumpets have the advantage of high acoustic effiency and their position at the back of the shell put a wider portion of the audience inside their coverage pattern. The saxes can’t compete 1 on 1 with a trumpet in any case – and for this reason the sax line is positioned in front. The front position moved them far off axis to us and this resulted in solos where the comping of the trumpets and bones often overrode the soloist. When soloists played, they would stand up and there was often lots of movement of the instrument. Each movement created a remapping of the direct-reverberant spatial character. Trombones seem, by their physical nature to be perpetual motion machines. This chart shows the different angles to my position with respect to the trumpet and saxes. The saxes were closer but at 65 degrees off axis their directionality was very apparent. I don’t bring this up as a “musical review” by the local critic. My context here is contrast to the PA-centric world view of our profession. A moving trumpet in front of our close mic does not remap the room. The level change and axial filtering would be far more dramatic than we experienced in our seats 10 meters away – and they were strong there. This is not something we can replicate with a close mic and our standard PA, even with surround speakers. The drum kit was back in the rear corner of the shell. There was a kick drum – buried under the piano – but this was hardly the driving force. The snare had 3 reflective surfaces nearby and had an unlocalized sound. The cymbals high, visible, and alone in their spectral range cut through easily. The signature sound of un-mic’d drums is part of the traditional jazz sound. This is evident in the character of so many jazz recordings as well as at this live show. The piano had the lid removed. It was located very close to the side of the shell, which substituted for the reflection that would have been given by an open lid. Like the drum kit, the piano sound fairly dark and distant – Like the drum kit, this sound was normal for traditional jazz – but strange for one who is so accustomed to hearing rhythm section instruments have the tight near-field sound. How would it have been different if we scaled the venue up to the point where we needed mics and a PA? Let’s make it a perfect mono PA – all the dynamics we need and flat response. First of all it would look like this on stage. Secondly we reset the mobile perceived sonic source placements to static positions – almost……because unless we are in a very BIG room we are still going to localize at least partly to the trumpets (fairly often) and trombones (less), drums (occasional). So going forward with the static model we no longer have moving reverb with the moving instruments. The reverb tail is now fixed for all channels. Any instrument that generates 1 kHz, for example, will fill the room from the PA perspective at the freq and decay from that perspective. This is different than the unamplified model, where each source of 1 kHz (each instrument) has a unique point of origination in the space – and with it a unique sequence of reflections. While statistically this will time out to be nearly the same decay time for each instrument position (or the PA), our listener perspective may detect the differences in spatial location -but most easily we will detect loss of direct sound (off axis or blocked ) of some instruments. Back to the PA. With close mic’ing we will get unobstructed on axis responses from all players. 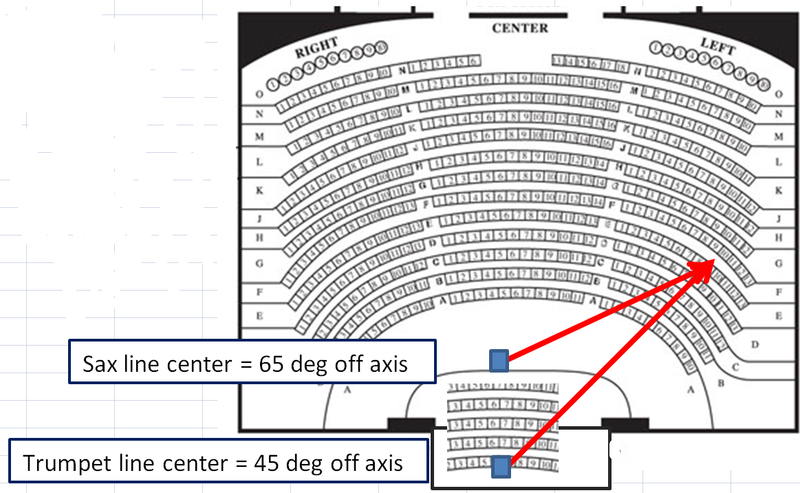 Seats that are off axis to the PA are equally off axis to all instruments. The challenge to the mix engineer then is to mix the sounds so that they most closely resemble a more distant relationship to the mics. This would be particularly challenging for the drums, since we are all so accustomed to the sound of close-mic’d drums. The biggest loser in the game is the piano – which must physically be reconfigured (lid on, maybe even closed) in order to get enough isolation to make the mics usable. This affects how the musicians hear the piano. Stage monitors – Pandora’s Box! There is much to learn from an experience like this. All forms of music originated in some form of acoustic environment – and NONE of these are arenas and stadiums. The style of the music is always linked to its original native environment. Gregorian chant would never have inspired its composers if not for cathedrals with 7 seconds of stone and glass reflections. Last night I got to hear the music of Count Basie in a room that would have had his band smile in the 1930’s if only we could remove the seats and get some couples out there doing the Lindy Hop. Our sound systems allow us to move bands from place to place and let the PA (and video screens) do the rescaling to the venue size. But when it’s all said and done we face the same challenge with the PA that we had with the unamplified version. 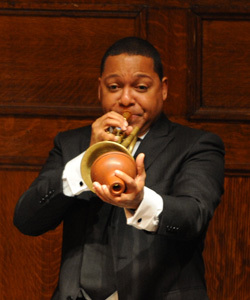 How to keep the trumpets from blowing everybody else off the stage! So these are just my musings. Hope you enjoy. It’s not like I plan on a career in doing sound where there is no sound system. I bet a lot of people have got so used to hearing the recorded version of instruments, that they don’t know/remember what it actually sounds like in real life. Thanks for commenting. Agreed about our getting to used to recorded – or PA’d versions of these instruments. I know very well the sound of these instruments up close – on stage, through the PA in the house. But in the house w/o the PA is that land in-between. For most of our work – the sound of the instruments direct is really irrevelevant – or worse – a nuisance because it is so out of balance in level and tone. But this particular type of music is arranged to be self-balancing in the space – and I was lucky enough to hear it in a room that was correctly scaled – -in size and acoustic prpoerties for the instruments. I learned a lot of similar things working three years at the Met Opera. It’s amazing how spatial the music becomes, and, depending on where you sit, you can often perceive louder instruments (trumpet, etc) coming from “behind” you due to reflections, etc. I read the mixtape post and agree that it links up to what i was experiencing with the JLCO. A very interesting one indeed. I am totally on board with your concert-goers bill of rights. Have fun with the band at school. Maybe I can hear a recording when I get there in May. You always have such incredible perspectives and the ability to communicate them thoroughly! Some of my most memorable moments as a mixing engineer were two shows with the Basie band! What was so great to me was that during the clinic in the afternoon there was no need for reinforcement. The hall was empty so I could move around and really experience all of what you’re post made me think about again. That night I tried hard not to contaminate, the hall seats about 1000. With just 2 section mics in each section balanced the same, solo mics down front, piano mics, bass mic, and 1 overhead above the drummers right ear the band proceeded to blend themselves magically! Another one of my own cherished memories was getting to hear James Moody’s Tenor Saxophone 6′ away, I had never heard a tenor sax sound so incredible. It was almost that great/real through my Meyer PA that night at the show. I have a trunk of T-shirts gathered from mixing in that room. The last time I took a rig in there was for a private party (I didn’t stay for the show :-), and what was required for the Temptations was a stacked small format line array on platforms. It got a little crowded with the PM5D shoehorned in between the PA platform and the SL edge. Measure? I don’t think so, not in this case. Best case was run some noise, adjust angles for minimum interference, try to hit the balcony, and wait for it to be over. I am very certain the audience did not notice the comb filtering from the completely inappropriate PA because of the 12 wedges spread out on the stage. The Sheldon has a checkered history of amplified events that should be somewhere else, but in all fairness, in my experience these are usually private parties at which the venue is ‘insisted’ upon by the client. This was exactly the case with the Temps, and while the promoter tried several times to convince their customer to do it elsewhere, they would not agree. The only reason the ‘other’ PA was brought in was from experience, we knew the house system would not keep up with the Temps and that is what we had available on that day. I have attended a handful of acoustic shows in there, and what everyone says is pretty much true: if there are no amplifiers or wedges involved, it is a great sounding space. Thanks for posting. Interesting story. Temptations a the the Sheldon. What’s next……….Guns n’ Roses at the Blue Note? People get the idea in their head of a venue and they just WANT to do it there – even when it is a really bad fit. Like this one: Robin Williams at Carnegie Hall. Looks like a great idea. Sounds like a TERRIBLE idea. Huh? What did he say? Hey Robin, talk SLOWLY. yeah right. But when you put the right brew in the bottle, it makes a fine wine, and this Marsalis band was def the right fit for this space.